Google Apps is well-suited for project management because it’s a cloud-based productivity suite that helps you and your team connect and get work done from anywhere on any device. 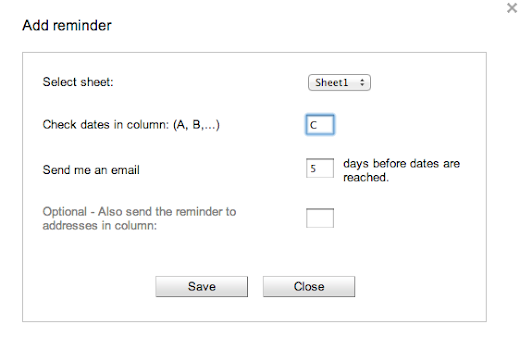 Using Google Apps Script, we can push the capabilities even further to create advanced scheduling and management tools. 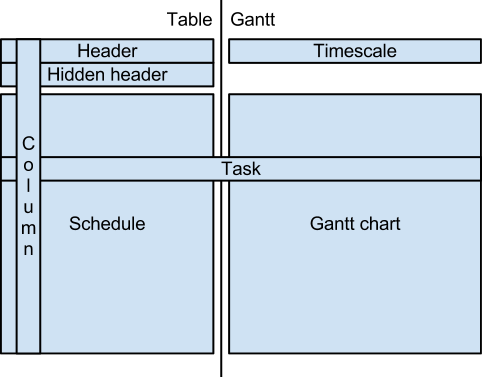 A common tool in project management circles is the Gantt chart: a schedule of the tasks in the project and how they relate to each other over time. 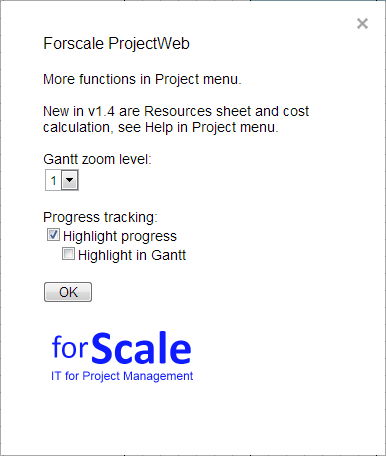 The spreadsheet that generated that Gantt chart is available in the template gallery today. In this post, we’ll explore the basics of how the template works and explain a few of the Apps Script techniques that transform Google Sheets into such a powerful project management tool. When you open the template, you’ll see stubs for each type of task, but the screenshot above shows an example of a slightly larger project plan — in fact, the same data used to generate the Gantt chart below. We have also used Apps Script’s addMenu() method to build a custom menu that calls row-oriented functions like indenting tasks to get a so-called Work Breakdown Structure with summary tasks. If you just want to see an overview, the custom menu allows you to collapse tasks, which we accomplished through the hideRows() method. For changes that do not trigger an onEdit() event (for example, clearing a row), the user can use the menu’s Refresh command to recalculate the schedule. 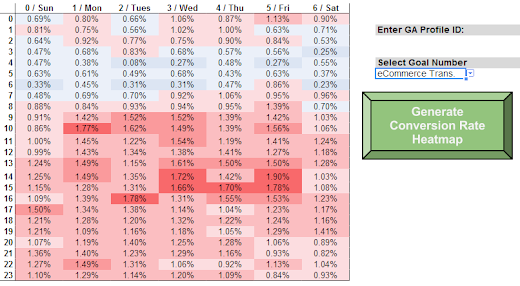 Finally, to render the Gantt chart, we use cell background colors to visually group and highlight the appropriate cells. This creates the effect of a continuous calendar with clearly visible start and finish dates for each task. Ronald combines his knowledge of project management and software solutions at his company, Forscale. He believes Google Apps is an excellent platform for online project management. He uses Google Apps Script to integrate the services to manage a wide range of projects. These days, small businesses are quickly increasing their online presence; a website outage during a critical period can be devastating to a mom-and-pop shop. Eduardo realized that existing network-monitoring solutions require a significant investment in technology and infrastructure that is beyond the reach of many small-business users. Using Apps Script’s UrlFetch and Spreadsheet services, he was able to quickly create a website monitor packaged in an easy-to-use spreadsheet that, given a list of URLs, tries to fetch each one and records the latency and content length. These are just some examples of how quickly useful apps can be created with Apps Script. Thanks to all the attendees for coming out! If you couldn’t make it to the hackathon, check out these tutorials to see how you can get started making great apps. 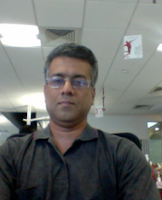 Kalyan is a Developer Programs Engineer on the Google Apps Script team based in NYC. He is committed to increasing developer productivity by helping them fully utilize the power of Apps Script. In his free time, he enjoys participating in the Maker community and hacking together robots. 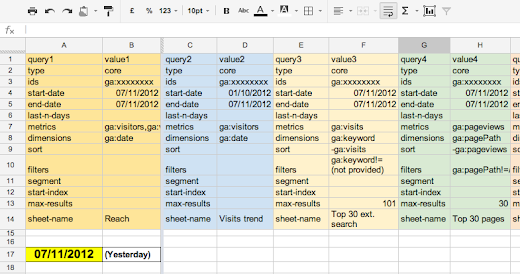 Working in Paid Search account management, I've often found tremendous wins from making reports more useful and efficient. Refining your analytics allows you to streamline your workflow, allowing more time for strategic and proactive thinking — and that's what we're paid for, not endless number-crunching. The integration between Google Analytics and Apps Script has opened up lots of opportunities for me to make life easier through automation. 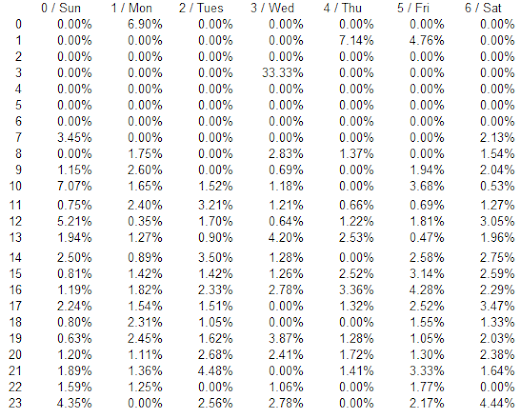 In a recent blog post on my agency's website, I outlined how an automated report can quickly “heatmap” conversion rate by time and day. The aim of the report is to provide actionable analysis to inform decisions on day-part bidding and budget strategies. In that post, I introduce the concepts and provide the scripts, sheet, and instructions to allow anyone to generate the reports by hooking the scripts up to their own account. Once the initial sheet has been created, the script only requires the user to provide a Google Analytics profile number and a goal for which they want to generate heatmaps. In this post, we’ll break down the code a bit. 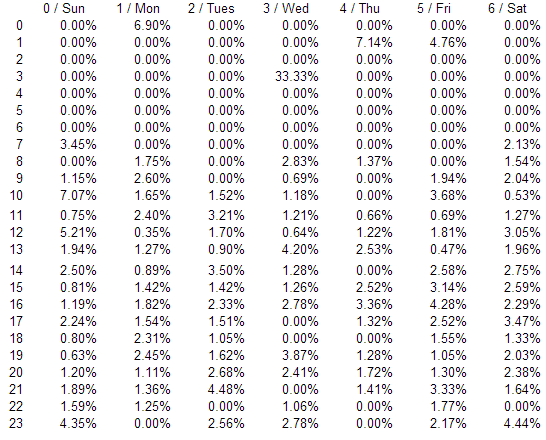 Once we’ve brought the Google Analytics data into the spreadsheet in raw form, we use a pivot table to plot the hour of the day against the day of the week. 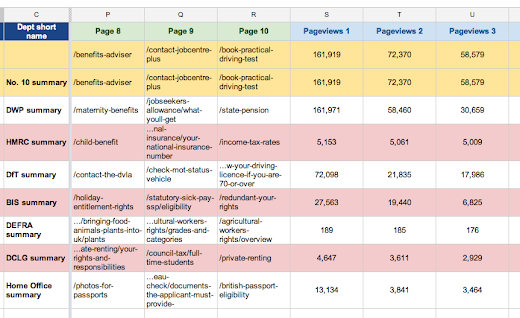 For this type of report, I'd like to use conditional formatting to heatmap the data — but conditional formatting in Google Sheets is based on fixed values, whereas we want the thresholds to change based on cell values. However, thanks to the flexibility of scripts, I was able to achieve dynamic conditional formatting. Calling the functions based on the profile ID and goal number specified in the main sheet gives us a quick, actionable report that can easily be adapted for use across multiple accounts. This was my first foray into the slick integration between the Core Reporting API and spreadsheets, but has proven a valuable test case for how effective it will be to roll this method of reporting into our daily process of managing accounts. We have now started the next steps, which involves building out “client dashboards” that will allow account managers access to useful reports at the press of a button. This moves us toward the goal of minimizing the time gathering and collating data, freeing it up to add further value to client projects. Editor's Note: If you're interested in further scripting your AdWords accounts, take a look at AdWords Scripts, a version of Apps Script that's embedded right into the AdWords interface. Guest author David Fothergill is a Project Director at the search marketing agency QueryClick, focusing on Paid Search and Conversion Optimisation. He has been working in the field for around 8 years and currently handles a range of clients for the company, in verticals ranging from fashion and retail through to industrial services. When we launched version 1.0 of Google Play services to all Android 2.2+ devices worldwide in September, one of our main goals was to provide developers with better tools for working with OAuth 2.0 tokens in their Android apps. 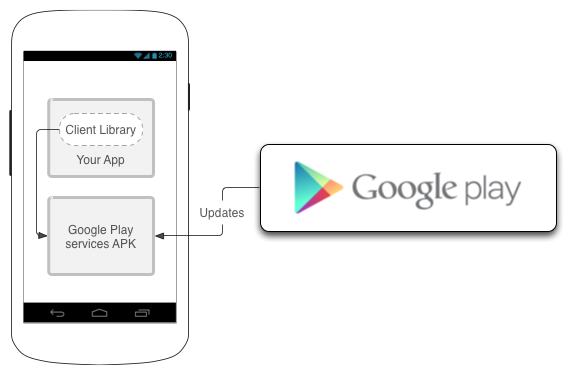 Thanks to the new components, Android apps can get access to Google APIs with an easy-to-use authentication flow and can provide a consistent experience to both their users and developers. We recently decided to test that statement by writing a small camera app that automatically uploads photos you take to your Google Drive account. We documented all the steps required to go from zero to hero in a quickstart guide. By following the step-by-step instructions in the guide, you’ll have a working Android app that uses Google Play services to perform authorization and the Google Drive API to upload files to Drive. Do you want to learn how to build this app but prefer to watch a video tutorial instead of reading the documentation? We’ve got you covered! Check out the recording of the Google Developers Live session that covers the setup and running of the quickstart app. If you’re building an Android app that integrates with Drive and have questions for us, please don’t hesitate to let us know on Stack Overflow. with GoDaddy and eNom, now with a new API available to any registrar, users can verify and transfer their email in 3 easy steps, down from 10–and users are no longer required to leave the Google Apps signup flow to complete domain registration. If you are a registrar interested in implementing this RESTful API to automate the DNS setup process, please apply here. Mohan Konanoor is a Software Engineer working for the Google Apps for Business team. He is currently leading various initiatives around the area of signing up and on-boarding for Google Apps. Setting up a new domain name and configuring it to work with Google Apps email is about to get a lot easier. We’re working with the top domain registrars worldwide to reduce the number of manual steps necessary for this portion of the signup process. We made improvements earlier this year to allow users to more easily verify their domain with GoDaddy and eNom, now with a new API available to any registrar, users can verify and transfer their email in 3 easy steps, down from 10–and users are no longer required to leave the Google Apps signup flow to complete domain registration. Guest author Ashraf Chohan works at the Government Digital Service (GDS), part of the UK Cabinet Office. GDS’s role is to deliver digital transformation of government services. 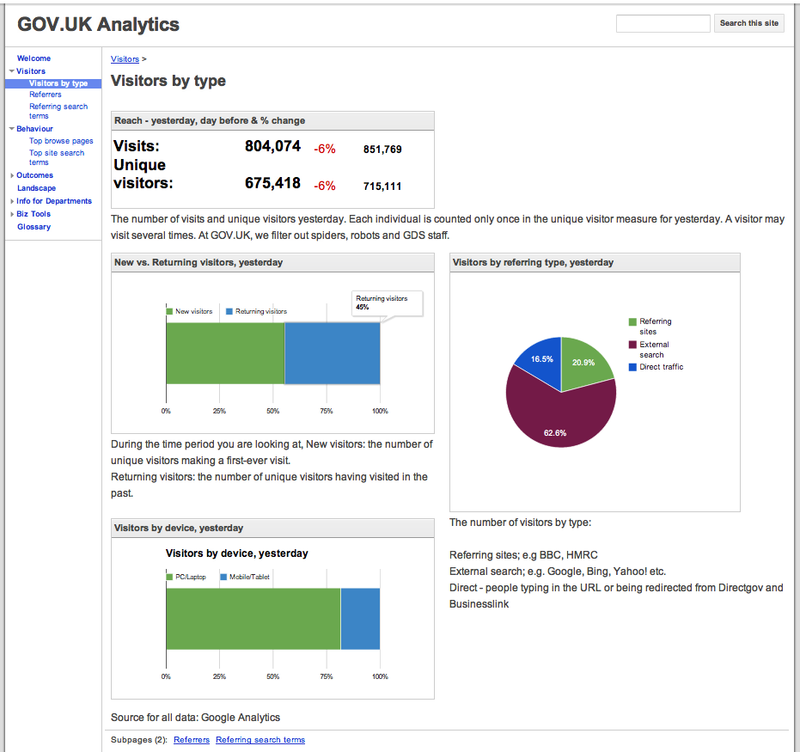 Ashraf is a Product Analyst for GOV.UK, a new site for public services and information. There are many tools available to help you manage a task list and Google Apps comes with its own simple Tasks app. 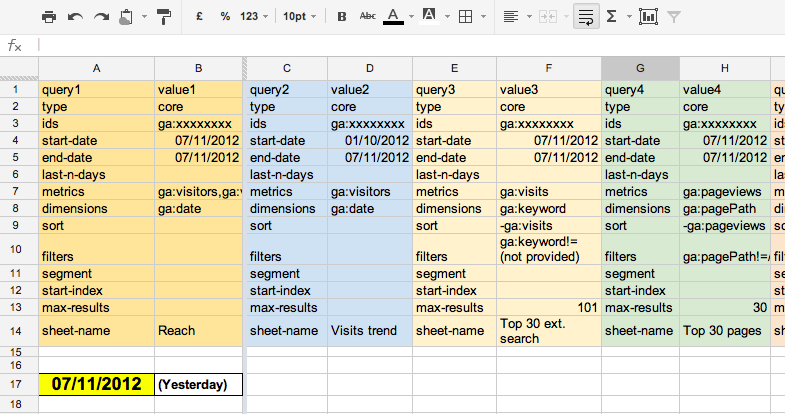 But sometimes it is more convenient and collaborative to simply manage your task list in a shared spreadsheet. This spreadsheet can be a simple personal task list or a project-management interface that requires team-wide coordination. This script is already available in the Script Gallery today. Try it out for yourself! Once you have installed the script, you get a new menu option in the spreadsheet that opens a simple user interface to set the options you want. As a developer, you can extend this interface further to provide more options and capabilities. The folder containing site assets must be public. Assets added to public folders must also be public on the web. Link to the files contained in the folder using the webViewLink (included in the folder’s JSON representation). It’s important to emphasize the added simplicity provided by a webViewLink: using this link as a starting point, you can extend the path to any web asset in any subfolder without worrying about retrieving the exact file ID. What used to look like 0B2Gk2F2ImIBiaUkwY3JNX1JMaTg is now a recognizably cute path such as images/kittens.jpg. For the root path to the folder, we’ll display a list of files in the folder, or, if you have an index.html file in your folder we’ll load that as expected. The ability to publish files this way opens lots of possibilities for Drive app developers. Writing a blogging tool, creating a process to publish updates to shared docs, outputting images in a folder in a gallery page — any Drive use case that involves presenting a file in a browser can benefit from site publishing. We look forward to seeing what you create, and we’re happy to answer your questions on Stack Overflow. Would you like to programmatically publish some web content? Or let your users do so in the context of your Drive app? in April, companies like Lucidchart or HelloFax have built powerful, slick, useful Google Drive apps, and many more companies are launching compelling integrations every day. During this time, our developer community — especially on Stack Overflow — has grown substantially. To help support our growing developer community and all the interest in integrating with Google Drive, we’re starting a series of Google Drive developer workshops. For the inaugural event, we are hosting several companies — including Shutterfly, Fedex, Autodesk, Twisted Wave, 1DollarScan and Manilla — to participate in a two-day workshop this week at the Googleplex in Mountain View, California. During this workshop, Google engineers will be on hand to assist attendees with various parts of their Google Drive integration: things like design and implementation of features, authorization flow, and Android integration. Companies have shown that the Google Drive SDK allows for deep integration in just a couple days and we really hope that attendees of this workshop will enjoy a similar experience. Tune back in later this week to find out more about what we learned and accomplished in our workshop. If you are interested in attending similar Google Drive workshops near you or if you want to contact the Google Drive team about a potential integration with your product, let us know. Since the public unveiling of the Google Drive SDK in April, companies like Lucidchart or HelloFax have built powerful, slick, useful Google Drive apps, and many more companies are launching compelling integrations every day. During this time, our developer community — especially on Stack Overflow — has grown substantially. Although writing for loops like this is a common pattern, it's a fair amount of typing and you need to keep track of counter variables that serve little purpose. Underscore provides an each() method that makes the process much simpler. Passing anonymous functions as parameters takes a little getting used to, but if you've worked with jQuery, the pattern feels familiar. When Underscore loads, it creates a global variable named "_" that you use to access its functionality. Apps Script specifically prevents the global scope of a library from interfering with the global scope of the script that includes it, so I built a helper function into the library to pass the variable around. In my script that includes the library, I simply make a call to that function and use the result to set up my own "_" variable. // In the script that includes the library. To try my copy of the Underscore library in your own project, use the project key "MGwgKN2Th03tJ5OdmlzB8KPxhMjh3Sh48" and the code snippet above. You can browse the full source code here. Using the code above, I could easily include the library in my server-side Apps Script code, but I also wanted to use these functions client-side in my web app served by the HtmlService. To accomplish this, I created a copy of the Underscore source code, wrapped it in <script> tags, and stored them in Html files (instead of Script files). These snippet files could then be included in my web app's HtmlTemplates using the helper function below. This function was called in the web app's HtmlTemplate using the simple code below. Integrating with Underscore was fairly easy, but trying the same approach with other open-source libraries may be a bit more complicated. Some libraries won't run correctly in the Apps Script environment if they rely on certain capabilities within the browser or Node.js runtime. Additionally, to be served by the HtmlService, the code must pass the Caja engine's strict validation, which many popular libraries don't meet. In some cases, you may be able to manually patch the library to work around these issue, but this usually requires a deep understanding of how the library works. We hope you're inspired to use Underscore and other open-source libraries in your own work. If you find a library that works great with Apps Script, share it with me on Google+ and I'll help get the word out. We’ve just launched the Google Apps Groups Migration API that provides Google Apps developers the ability to build tools that can move shared emails from any data source (typically shared mailboxes, public folders and discussion databases) to their domain’s Google Groups discussion archives. Google Groups provides a simple and easy way to ‘tag’ the migrated emails into manageable groups that can be easily accessed by users with group membership. This new api complements existing Google Groups api’s like Google Apps Provisioning API which can be used to create new groups (to which the shared emails can then be migrated using the newly launched API) and Google Apps Groups Settings API which can be used to control access to the group. The addition of the Google Apps Groups Migration API thus makes the ‘shared folder’ experience seamless even after migration to Google Apps. 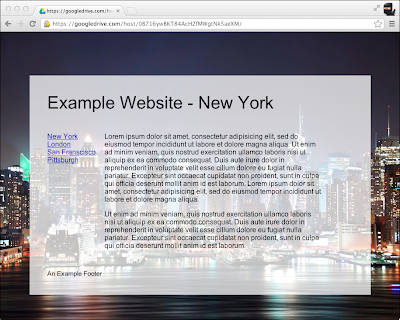 To learn more and try out this new feature visit Google Developers. Rishi Dhand is a product manager working for the Google apps for business team. In addition to working on data migration features, he also works Google apps administration platform with focus on building new security and admin reporting features. In his free time, he enjoys playing squash and badminton. Ever wondered how to move your organization’s emails from a shared mailbox or a public folder when migrating to Google Apps for Business? Going, going, gone! Apps Script on tablets. , a global auctioneer company based in Alexandria, Virginia. The company uses Google Apps for their entire business workflow, so their documents, calendars, etc. are all connected. We manage the shipping process on-site using a tablet. In this fast-paced environment and with limited time, we need a quick, easy solution. When an auction ends, the clients fill out a Google Form that saves their shipping and payment information to a Google Spreadsheet. This information then needs to be sent to a specific mover for processing -- but the mover doesn't need all the data, just a few important pieces. All of this needs to happen with as little human intervention as possible. Our solution was to create an Apps Script within the spreadsheet, which means our new functionality works in the tablets used on the auction floor. The function below runs when the sheet is opened, automatically sorting the sheet to put the newest client on top. A simple dialog determines which data is important for a particular auction; the script then finds the data we need, sends it to the right person, and adds a calendar event as a reminder. // What row do we want? Looking at the source code, we can see how we collect the data from the relevant columns, add them to a variable, and in one line send it via Gmail. Adding a reminder to our calendar also takes just one line. Do you have a repetitive process that bugs you? Wish there was a way to automate something? You might be able to solve your problems the same way I helped out my family -- with Apps Script! Feel free to leave a comment on some ideas or suggestions for future projects. Tom Fitzgerald is an engineer for Google at their Mountain View headquarters. While attempting to keep his HTML5 blog up to date he works on various web development side projects. Originally from Maryland he supports the Baltimore Ravens & Orioles! Anyone else get stuck with fixing their family's computer problems? Recently I had a family technical issue that was actually fun to solve and didn't involve removing malware. My family owns Rasmus Auctioneers, a global auctioneer company based in Alexandria, Virginia. The company uses Google Apps for their entire business workflow, so their documents, calendars, etc. are all connected. 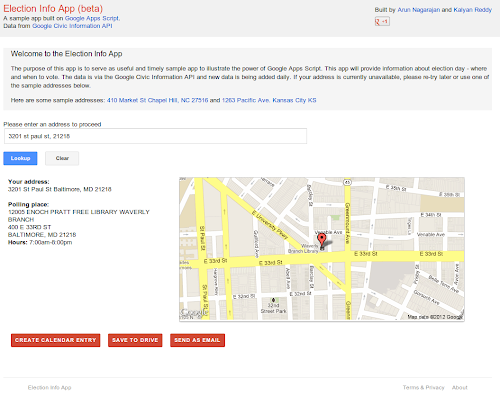 earlier blog post, we announced the Election Info sample app. We briefly talked about how we were able to use Apps Script to easily create a comprehensive sample application that provided timely voting information. This post shows just how easy it is to use Apps Script to get information from an external API and integrate with various Google services to create a rich web application and provide a meaningful user experience. After getting the response object, we can simply drill into it to access various data provided by the API. One of the things the response object provides us with is the election date. Using Apps Script's Calendar service, it is really easy to create an event on voting day in the user's calendar with the polling address. First, we create a Date object from the date string. We then create an all-day event on the default calendar on this date, passing along the polling address we get from the response object. Using the Maps service, we can generate static maps with the user's home or polling address as shown in the following code snippet. 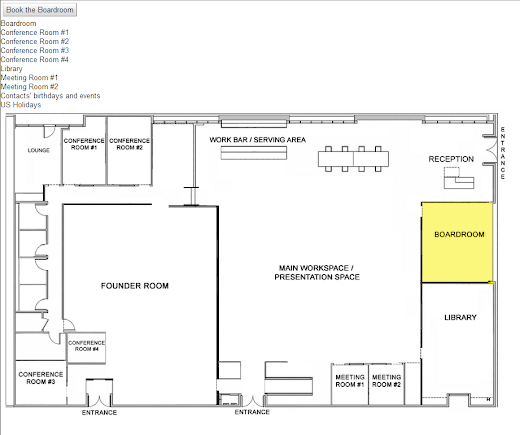 We display these maps on the web app page, then embed them in the reminder email and bring-along document as we will show in the following sections. // normalizedAddress looks like "501 Kildaire Rd Chapel Hill, NC 27516"
We also provide a simple method for users to email themselves all of this information. Using the Gmail service, we can send an HTML email that embeds the voting information and the static maps we generated above. The Apps Script documentation contains great tutorials such as the Maps tutorial we used to generate the directions below. Using the Document service, we were able to easily generate a bring-along document with polling address, hours, and directions. The follow code excerpt shows how easy it is to add different elements like headers, tables, and paragraphs to a document. Apps Script also provides an extensive list of methods to programmatically control the look and presentation of the various elements. 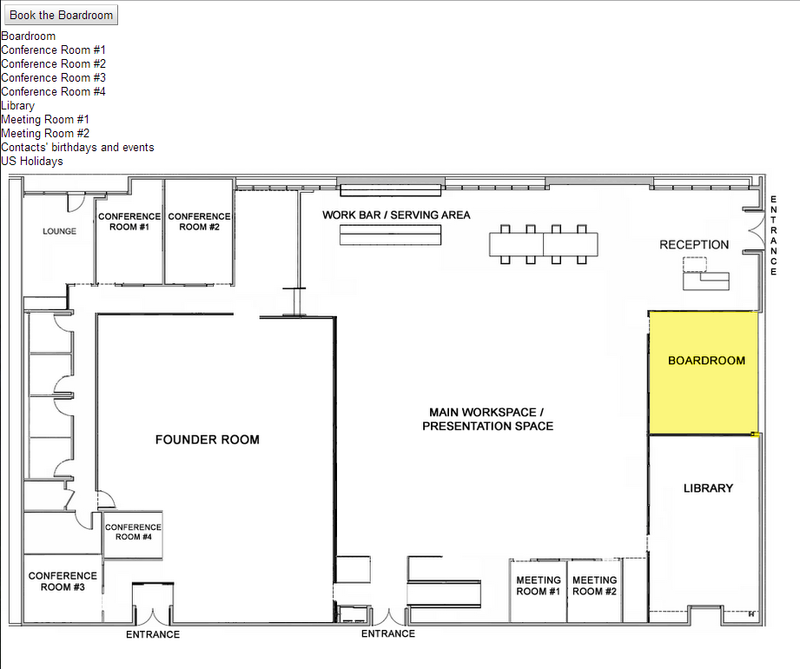 Here is an image which shows the generated bring-along document embedded with static map images from the Maps service. Apps Script allowed us to easily take information from an external API and tie it into various Google services to provide a great user experience. Stay tuned for an upcoming blog post showing how we created the front end! 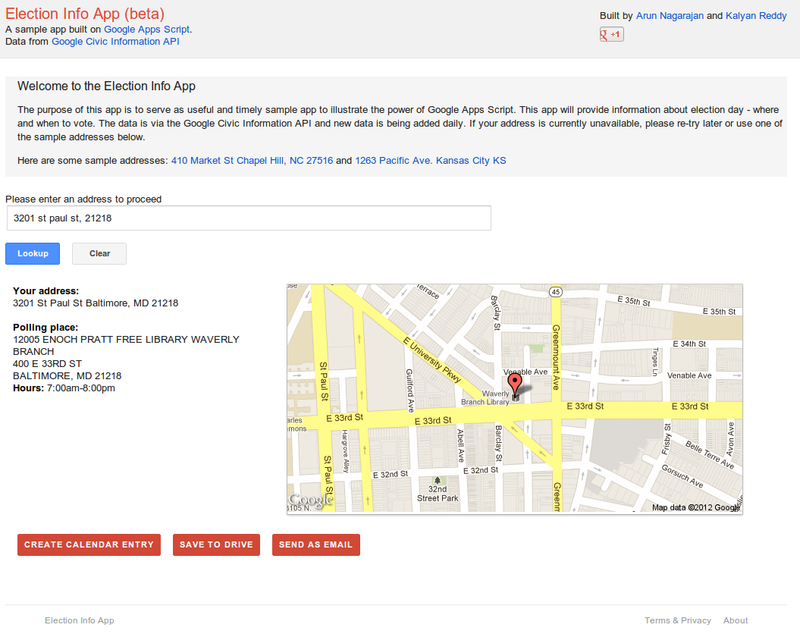 In an earlier blog post, we announced the Election Info sample app. We briefly talked about how we were able to use Apps Script to easily create a comprehensive sample application that provided timely voting information. This post shows just how easy it is to use Apps Script to get information from an external API and integrate with various Google services to create a rich web application and provide a meaningful user experience. in 1620 A. D., hundreds of years before the internet was ever invented, and it just gets more and more true as time goes on. In our online world of information, entertainment, and socializing, everyone is connected -- and everyone wants to collaborate. Would you like to open a collaborative space in your Drive app by injecting comments and discussion threads in your users' files? This is now easily done with the Drive API. Using the new comments and replies resources together with a simple anchoring scheme to nail down the location of comments in your document, you can provide discussion threads much like the ones found in Google Docs. A comment starts a discussion thread. It is anchored to some location in the file -- for instance, a line or lines in a text document, or a rectangular area in an image file. A reply is (as you might guess) a reply to a comment. Replies are tied to the status of the parent comment, so that deleting a comment also means deleting all of its replies. In a typical scenario, an app gets the head revision of a file, lists the existing discussions, and inserts or deletes comments and replies as needed. It’s recommended that apps should also perform user permission checks and make sure commenters are authorized. These best practices, along with a complete reference for anchoring comments in files, are detailed in Managing Comment and Discussions in the Drive SDK. For a great example of commenting best practices, you won’t need to look any further than the Google docs in your Drive. The features you see in our own implementation -- highlighted anchoring, UI options to reply, resolve, edit and delete -- are all available for you to add to your own app. We look forward to seeing how you integrate comments and discussions in to your Drive app! Do a better job than Google docs, and we promise to be more pleased than surprised. If you have questions or feedback about comments and discussions, don’t hesitate to let us know on our Stack Overflow tag, google-drive-sdk. "No file is an island." John Donne said something a bit like this in 1620 A. D., hundreds of years before the internet was ever invented, and it just gets more and more true as time goes on. In our online world of information, entertainment, and socializing, everyone is connected -- and everyone wants to collaborate. In Google Apps domains, the domain administrator can grant applications domain-wide access to its users' data — this is referred as domain-wide delegation of authority. This basically allows applications to act on behalf of Google Apps domain users when using APIs. Until recently this technique was mostly performed using 2-Legged OAuth 1.0a (2-LO). However, with the deprecation of the OAuth 1.0 protocol and the resulting programmed shutdown of 2-LO, the recommended authorization mechanism is now to use OAuth 2.0 and service accounts. Unlike regular Google accounts that belong to an end user, service accounts are owned by your application and therefore identify your application. They can be created in the Google APIs Console and come with their own OAuth 2.0 credentials. Google Apps domain administrators can delegate domain-wide authority to the service account’s credentials for a set of APIs. This results in allowing the application, by using the service account’s credentials, to act on behalf of the Google Apps domain’s users. If you’d like to learn more, have a look at the recently published Google Drive SDK documentation on using OAuth 2.0 and service accounts for domain-wide delegation of authority.. These documents provide a step by step process and code samples to help you get started with service accounts. Some enterprise applications need to programmatically access their users’ data without any manual authorization on their part. 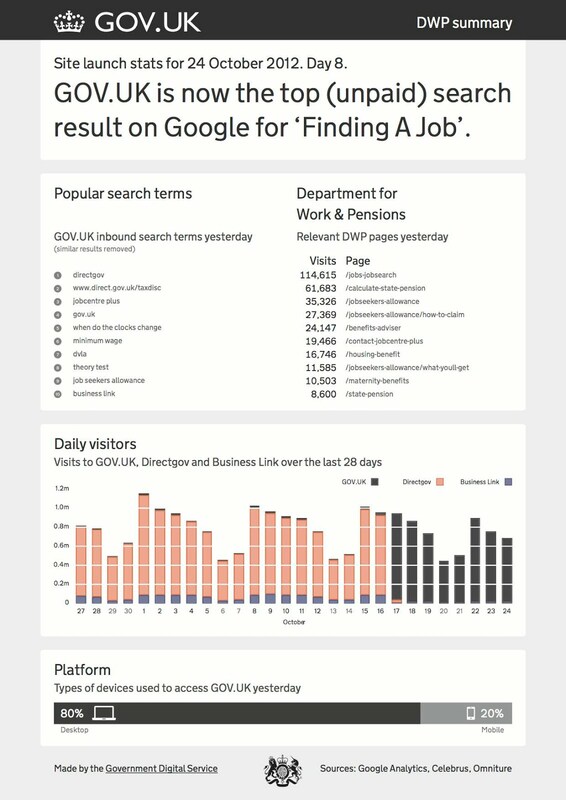 For example, you might want to use the Tasks API to add a task to all of your employees’ Google Tasks lists during the holiday season to remind them of something like, “Come pick up your holiday gift at the front desk!” Or, you might want to run some company-wide analysis of the content of your employees’ Google Drive. From nations choosing presidents to offices selecting which coffee to brew, we often find ourselves involved in election systems designed to choose the best option. This spring my alma mater's solar vehicle team, CalSol, needed to elect new leaders. Our previous system was painfully slow, involved "raising hands" in a room, and excluded any team members who could not attend a specific meeting. I set out to solve these problems and the result was an easy method for running fair elections in a matter of minutes. Google Forms: Allows members to submit their votes from anywhere. 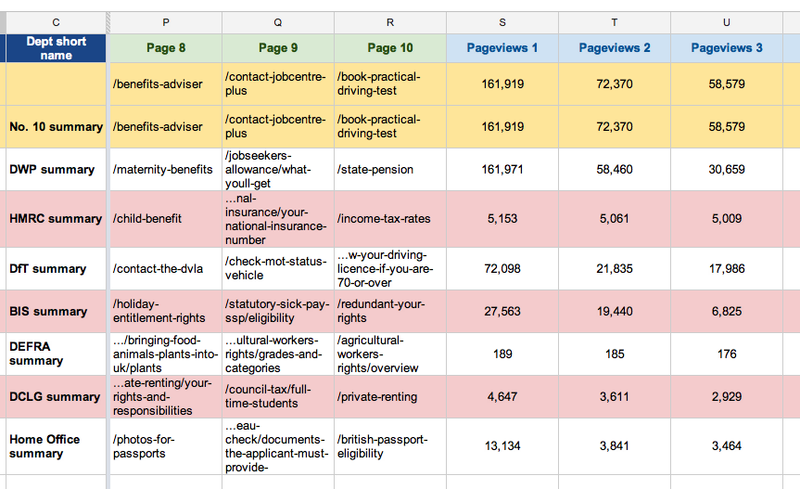 Google Spreadsheets: Makes it easy to audit the votes and configure the system. 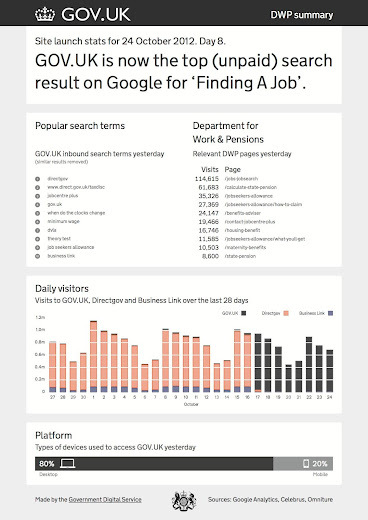 Google Apps Script: Simple way to access the results and determine the winner. I used a lesser known voting system called instant-runoff voting (IRV), or the alternative vote, which asks voters to rank candidates rather than cast a single vote. These votes, along with a secret voting key which I provided to each member, are recorded with a Google Form that automatically populates a spreadsheet. The code in Apps Script looks through the spreadsheet to count the votes while ensuring that each voting key is only used once. The secret keys not only prevent voters from casting multiple votes, but they also allow voters to change their vote by submitting the form again. Below is a simplified snippet of code that shows the general process used to calculate the winner. I learned that putting a little effort into Apps Script can make people happy and save a lot of time. The team feedback was outstanding. One CalSol member said the process was an "Excellent, clean, and professional voting process. This should become a standard [for the team]." I was elated when I was able to close the polls during a meeting and announce the winners of twelve independent elections in just a matter of minutes. Try the script yourself to make sure your coffee preferences are heard! Chris is a Developer Programs Engineer based in Mountain View on the Google+ team. He previously worked on solar vehicles at UC Berkeley and wants developers to write software that makes our lives better. In his spare time he likes to play soccer and throw the ball in after doing a front handspring. provides a great service to programmatically obtain much of this information based on the your home address. Google Apps Script makes it really quick and easy to build a web application that queries this information and uses various Google services to organize and track your information. Display polling information using HtmlService with jQuery for a clean effective UI. Generate static maps via UrlFetch and the MapsService to show polling maps and directions. Create a calendar event for election day with your polling location using the Calendar service. Generate a bring-along document with poll directions and hours using the Document service. Send you an email with a summary with your polling place information using the Gmail service. Store your previous searches in UserProperties so it will remember your likely home address the next time you launch the app. As you can see, this is a comprehensive sample app that is useful while also highlighting key Apps Script capabilities. Install the app from the Chrome Web Store. Check back soon as we will be writing a blog post with details and sample code on how the sample was built. 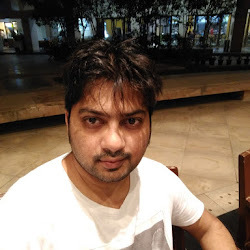 Arun is a Developer Advocate on Google Apps Script. Arun works closely with the community of partners, customers and developers to help them build compelling applications on top of Google Apps using Apps Script. In the past, he spent over 9 years building and designing platforms and infrastructure for enterprise mobile applications.. Arun is originally from the Boston area and enjoys basketball and snowboarding. It’s time for the 2012 General Election in the United States and along with it comes the tedious process of finding your voter registration, polling sites, times, directions, etc. The previously announced Google Civic Information API provides a great service to programmatically obtain much of this information based on the your home address. Google Apps Script makes it really quick and easy to build a web application that queries this information and uses various Google services to organize and track your information. at Google I/O, we’ve been quietly updating the DrEdit sample application to use the new API. As part of the update, the UI for DrEdit has been rewritten to use AngularJS, a modern web application toolset developed by Google and used in apps at DoubleClick. You might be wondering -- why go through the trouble of rewriting the UI for a basic sample app just to show off some new API features? Turns out it was more of a happy coincidence, but a valuable one and great learning experience! I had the pleasure of co-presenting a session on building great apps for Google Drive, and a big focus of the talk was on all the little things that go into making an app intuitive and user-friendly. This is particularly important for Google Drive, where many users are already familiar with the built-in apps like Docs, Presentations, and Spreadsheets. The first version of DrEdit was a good demo app, but didn’t follow all of our recommendations. I didn’t want to tell developers all the things they should be doing without having tried them myself. I decided to write a separate sample for the talk and needed a solid base to build on. It was the perfect opportunity to learn a new tool! The one catch with this approach is it requires any changes to the model to be made inside the scope of a scope.$apply(fn) call. In most cases, this is done automatically. When working with external libraries or raw XMLHttpRequests that can fire asynchronous callbacks, calling $apply yourself is necessary to make sure mutations are tracked correctly. No, I’m not talking about the hit song by 80’s band Naked Eyes, rather Angular’s $q service based on one of the proposed CommonJS Promises APIs. If you’re already familiar with JQuery’s deferred object or any of the other related implementations, this is familiar territory. If not, time to learn. Working with deferred objects can be a lot easier than the traditional callback approach. You can compose async tasks either serially or in parallel, chain callbacks, and return deferred objects from functions like normal results. Where this mostly comes into play is Angular’s $http service. If you’ve used jQuery, you’ll find it similar to jQuery.ajax() & the jqXHR result. It is based on the deferred/promises API and also ensures callbacks are executed correctly inside $apply for safe & efficient model mutations. This combination makes it easy to work with remote services in Angular. and have that sync with the model just like any other input in Angular. I started down that route, but correctly wiring up ACE to do that was more effort than it seemed worth at the time. This resulted in some other warts with how the app’s routes & views are structured. Talking to the backend servers. Not so much an issue with Angular, but rather with a late decision to replace the DrEdit UI. The original goal was a separate app. Once we decided to build on the previous sample, I didn’t want to make unnecessary changes to the server side code that was already written. This led to implementing some of the new features in less than ideal ways. For example, the editor can not independently save metadata from the document content when the file is renamed or starred but the content left untouched. A minor inefficiency, but something that could have been done better. I know I’ve only scratched the surface and have a lot more to learn. Even so, it was incredibly fun diving head first into AngularJS, and I highly recommend considering it if you’re dissatisfied with your current framework or just want to learn something new! 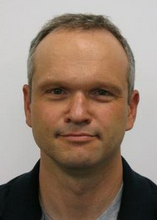 Steve is a Developer Advocate for Google Drive, Google Apps, and the Google Apps Marketplace. He enjoys helping developers find ways to integrate their apps and bring added value to users. Since we released version 2 of the Google Drive SDK at Google I/O, we’ve been quietly updating the DrEdit sample application to use the new API. As part of the update, the UI for DrEdit has been rewritten to use AngularJS, a modern web application toolset developed by Google and used in apps at DoubleClick. You might be wondering -- why go through the trouble of rewriting the UI for a basic sample app just to show off some new API features? Turns out it was more of a happy coincidence, but a valuable one and great learning experience! now exposes Exif data for photos, so that Google Drive Apps can use it. The Exif data contains information about camera settings and photo attributes. Despite being an awful photographer, I love photographing benches, and here is one I took while at the beach. Let’s have a look at some of these new fields for this photo. So whether you are just storing your amateur snaps like me, or using Google Drive to store serious photographs, we hope this will be useful information for Drive apps. For example, a photo organizing application will be able to create thumbnail and information views for photos without ever having to download them. For more information, please visit our documentation, and if you have any technical questions, please ask them on StackOverflow. Our team are waiting to hear from you. Do you like to store photos in Google Drive? You are not alone! Photographs are one of the most common file types stored in Google Drive. The Google Drive API now exposes Exif data for photos, so that Google Drive Apps can use it. The Exif data contains information about camera settings and photo attributes. , the file content is not known to Drive and a thumbnail can’t be automatically generated. 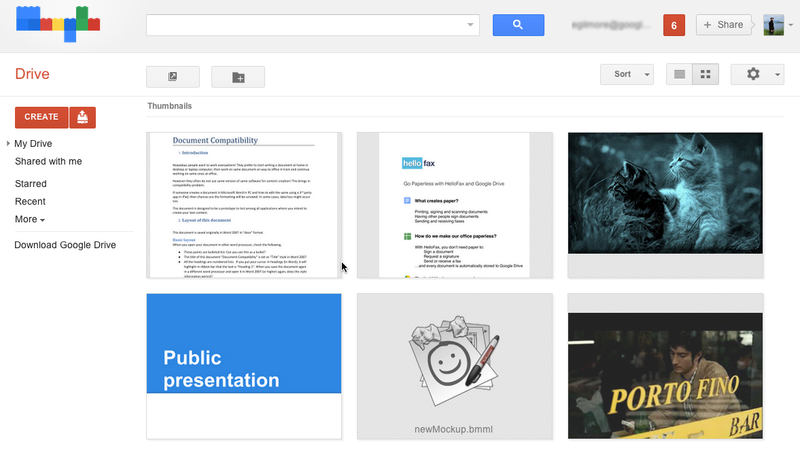 Developers can now use the Google Drive SDK to provide thumbnail images for those files. The new thumbnail property on the File resource includes two sub-properties that you can set when uploading a new file or updating an existing one: “image” to contain the base64-encoded image data and “mimeType” to specify one of the supported image formats: “image/png”, “image/gif”, or “image/jpeg”. As thumbnails must reflect the current status of the file, they are invalidated every time the file content changes, so your application should make sure to always upload a new thumbnail together with the updated content. For more information and to learn about all requirements and recommendations about this new feature, please refer to the Uploading thumbnails section of the Google Drive SDK documentation, and don’t hesitate to ask us your technical questions! Whenever you upload a file to Google Drive, we try to be smart and understand more about the new file. 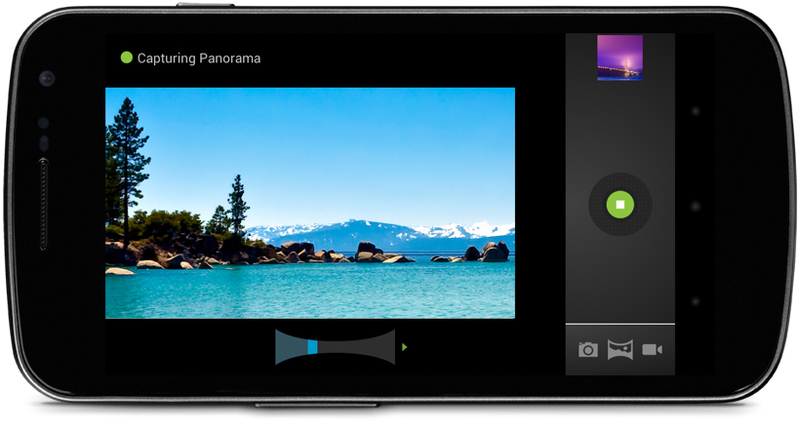 We index its text content, generate thumbnails and even use Google Goggles to recognize images. However, as any kind of files can be uploaded to Drive, there are cases where it is impossible for Drive to understand what the file content is. For instance, when inserting or updating a shortcut, the file content is not known to Drive and a thumbnail can’t be automatically generated. However, some applications work better with document or application data stored in a database. For example, let’s imagine a modern, web-based project management tool that provides lots of awesome features via data objects that are assembled dynamically at runtime for presentation to the user. In such cases, there is no single file to store all the data that comprises the project -- though there is of course a named “file” item that users will want to save and list in their Drive. Drive applications like this can create file-like entries called shortcuts that allow users to organize, access, and share items as if they were files stored in Drive. For examples in other supported languages, see the Drive SDK documentation. Opening shortcuts in Drive always launches the application that created them. Shortcuts can even be synchronized to the desktop. Opening a shortcut from the desktop will launch the application that created it in a new browser tab. Always call files.get with the current user’s access token to verify the user has access to the content. Restrict user actions based on the userPermission property of the file and disable saves if the user only has reader or commenter roles. Honoring permissions not only ensures the protection of user data, but also provides a consistent user experience and added value to Drive applications. Users should be able to safely share an item in Drive without worrying about the particular implementation details of the application that created it. The Drive SDK allows apps to store all kinds of files and file-like items in user-managed cloud storage. Files can be standard document formats like PDF, images, video & audio clips, or even your proprietary application data files. Storing files in Drive makes it easy for users to organize, search, and securely share them with their coworkers, friends, or family. , doctopus, and autocrat, which he uses to create powerful systems that tie together Google Forms, Spreadsheets, Docs and GMail in a way that teachers and administrators can maintain and enhance. Flubaroo is another popular script among teachers, as it extends the usability of Google Forms for online assignments. After students have submitted their responses this script scores their answers against an answer key, generates histograms of the class's performance, and sends out personalized emails to each student with their grades. Even more exciting, however, is that teachers have been writing their own scripts to solve problems and make their lives easier. For example, Adelphi University professor Lee Stemkoski wrote a small script that he uses to populate a Google Calendar with the topics for each lecture he'll give during the semester. In just 30 lines of code he was able to complete a long, monotonous task with the click of a button. Teachers looking to get a better idea of how Apps Script works and what it can be used for should watch our video Google Apps EDU Fireside Chat: An Introduction to Apps Script. In it we cover the basic functionality and use cases supported, and even do some live coding to show how easy it is to get started. More than 20 million students, faculty and staff worldwide use Google Apps for Education, so if you build something interesting and worth sharing, consider publishing to the Chrome Web Store. Over the past few years we've seen lots of Apps Script adoption within the EDU community. Educators need lightweight systems that integrate with the Google Apps they already use. Empowered by a cloud-hosted and simple to use platform, non-programmers have been able to create powerful scripts that have a real impact on the lives of their students. In honor of World Teachers' Day we're highlighting some popular scripts educators have created and other materials teachers can use to get started. Earlier this year we sat down with Andrew Stillman, Program Officer for Digital Instruction at New Visions for Public Schools and co-founder of youpd.org. We discussed about how he uses Apps Script to build solutions for the New York City school system. He's the author of many popular scripts in the Script Gallery, including formMule, doctopus, and autocrat, which he uses to create powerful systems that tie together Google Forms, Spreadsheets, Docs and GMail in a way that teachers and administrators can maintain and enhance.